Growing retail & hospitality sectors, rising construction activities across new housing societies along with increasing establishment of SMEs and commercial hubs have fueled the market for room air conditioners in India. Additionally, growth in construction projects across all metros & tier-1 and tier-2 cities have further spurred the growth of room air conditioner market in the country. Though the prices of room air conditioners are increasing in India, companies are offering various kind of schemes such as EMI and seasonal discounts which are highly attracting middle class population of the country. According to 6Wreaserch, India room air conditioner market size is projected to grow at a CAGR of 13.7% during 2019-25. India room air conditioner market is highly competitive and fragmented with presence of domestic, international and unorganized market participants. 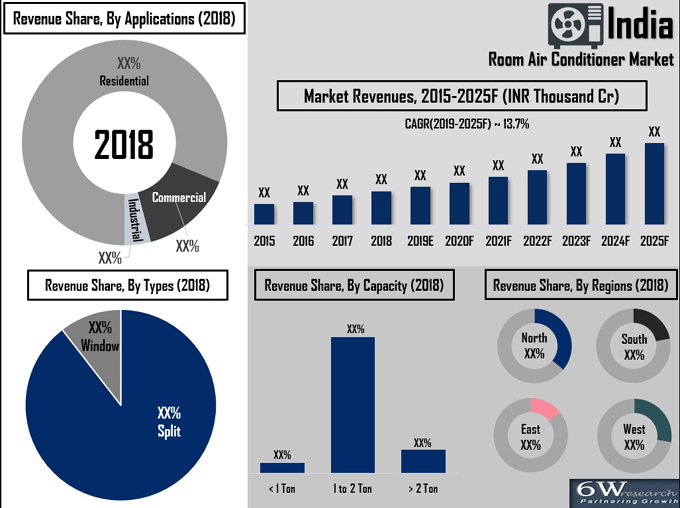 The market is broadly divided into two segments, within that split room air conditioner segment dominates the market and would continue to generate key India room air conditioner market forecast period revenues. The demand for room air conditioner is primarily growing in the residential market. By capacity, 1 to 2-ton room air conditioners exhibited largest market revenue share in the overall India room air conditioner market share. The typical average room size of an Indian household makes them best suited for consumers to buy them. In India, the Northern region has captured major share in the overall room air conditioner market in India on account of improving residential sector followed by the Southern and Western region. The India room air conditioner market report thoroughly covers market by types, by capacity, by applications and by regions. India room air conditioner market outlook report provides an unbiased and detailed analysis of the on-going India room air conditioner market trends, opportunities/high growth areas, market drivers, which would help the stakeholders to device and align market strategies according to the current and future market dynamics. 17.2 Daikin Airconditioning India Pvt. Ltd.
17.4 LG Electronics India Pvt. Ltd.
17.8 Panasonic India Pvt. Ltd.
3. India State-Wise Housing Requirement by 2022 (Million) Cont..